We have been kayaking the Lena and Sinaya rivers in Summer 2016 and visited the pillars on the banks of both rivers. It was an absolutely stunning experience. 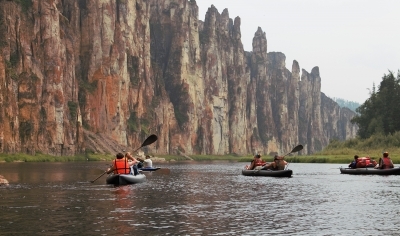 The pillars are located some 200 kilometers south of the city of Yakutsk. To get to Yakutsk is actually not that difficult though it is definitely one of the most remote places on earth. There are several flights a day from Moscow. For instance, getting to Yakutsk from one of the larger European airports via Moscow costs about 800 euros for a round trip. The journey from Europe takes at least 12 hours, a two to three hours flight to Moscow, the transfer and then a almost seven hours flight from Moscow to Yakutsk.